The IBM System/360 Model 30 was a low-end member of the IBM System/360 family. It was announced on April 7, 1964, shipped in 1965, and withdrawn on October 7, 1977. The Model 30 was designed by IBM's General Systems Division in Endicott, New York, and manufactured in Endicott and other IBM manufacturing sites outside of U.S. 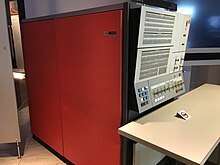 The Model 30 was a popular IBM mainframe announced in 1964 across the world as the then least powerful of the System/360s – the first line of computers in the world to allow machine language programs to be written that could be used across a broad range of compatible sizes. It was the smallest model that had the full System/360 instruction set (unlike the Model 20) and served as a stand-alone system, communications system or as a satellite processor of a larger system. The first delivery of the 360/30 was in June 1965 to McDonnell Aircraft. Along with the 360/40, these were the two largest revenue producing System/360 models, accounting for over half the System/360 units sold. It was little publicized that there were two versions of the Model 30,:pp.2,8,9 known (on the rare occasions when they were distinguished at all) as the 30-1 and the 30-2. The original 30-1 had a 2.0 microsecond storage cycle. Later, after the first 1000 30-1 were shipped, it was replaced by the 1.5-microsecond 30-2, although the 30-1 was silently retained in the sales catalog. The two were cosmetically different; the 30-1 looked like other System/360 models, with indicator lamps exposed on the front panel and labeled, but the 30-2 took a retrograde design step, putting the lights behind a stencil, as they had been on pre-360 machines like the IBM 1401. The 7th edition of IBM System/360 Basic Operating System Programmer's Guide, dated September 1967, lists first among major changes support for "an intermediate storage size (24K) for System/360 Model 30." In response to competitive pressures, IBM introduced a memory upgrade option, allowing 96K on a 360/30. It seems, based on the system's front panel, that a provision for supporting more than 64K had been pre-planned. The microcode was stored in CCROS (Card Capacitor Read-Only Storage) developed in Endicott. The Model 30 and Model 40 were originally supposed to share the transformer read-only storage (TROS) being developed at IBM Hursley, but CCROS was cheaper to manufacture. This system used Mylar cards the size and shape of a standard IBM punched-card, so the microcode could be changed using a keypunch. Each card held 720 bits, and the total microcode consisted of 4032 60-bit words. The Mylar "encased copper tabs and access lines." A hole punched at a specific location removed the copper tab and encoded a zero, unpunched locations were read as ones. The minimum memory needed to run DOS or TOS was 16 KB. TOS (Tape Operating System), as the name suggests, required a tape drive but no disk. It shared most of the code base and some manuals with IBM's DOS/360 and went through 14 releases. TOS was discontinued when disk drives became more affordable. DOS (Disk Operating System) was a popular choice for the 360/30. Programming was mostly in the COBOL, RPG and Assembler languages for the commercial applications which were the predominant uses of this computer. Fortran could also be used for the scientific and engineering applications, and a PL/I subset compiler PL/I(D) was available. COBOL programs for other computers could be run after recompiling on the System/360, except that the INPUT-OUTPUT SECTION had to be re-written to describe to the System/360 device assignments. The ability to continue running programs designed for earlier systems was crucial to selling new hardware. Although the instruction set of System/360 was not backward compatible with earlier systems, IBM provided emulators for the earlier systems. With the additional Compatibility Feature hardware and Compatibility Support software under DOS/360, the IBM 1401/1440/1460 object programs could be run in the emulation mode, with little or no reprogramming. Many installations included the compatibility feature, allowing older programs to be run. The IBM 1130 was the preferred successor to the IBM 1620. Fortran accounted for a significant part of how the 1620 was used, and IBM 1620 Fortran programs could be converted to run on System/360. ^ The source cited prefixes its statement with "Amazing fact:"
^ a b "IBM Archives: System/360 Model 30". IBM. Retrieved 16 August 2016. ^ a b c d Pugh, Emerson W.; Johnson, Lyle R.; Palmer, John H. (1991). IBM's 360 and early 370 systems. Cambridge, Mass. : MIT Press. ISBN 9780262161237. ^ a b c d e IBM System/360 Model 30 Functional Characteristics (PDF). August 1971. GA24-3231-7. ^ a b IBM System/360 Basic Operating System Programmer's Guide (PDF). IBM. September 1967. C24-3372-6. ^ Historical Note: A posted submission to Ed Thelen's 360/30 writings (http://ed-thelen.org/comp-hist/ibm-360-30.html) signed LEONARD.BEARES.ctr (at) disa.mil (December 2005) indicated that, in response to a 128K offering by a small company, IBM actually introduced an upgrade, allowing 96K on a 360/30. BEARES noted that this allowed hour-plus tape/disk-based sorts to be done in-core in minutes. ^ a b Field Engineering Theory of Operation, 2030 Processing Unit, System/360 Model 30 (PDF) (Fifth ed.). IBM. June 1967. Y24-3360-1. ^ Model 30 Microprogramming Language (PDF). IBM. ^ IBM System/360 Model 40 Operating Techniques (PDF). IBM. C20-1635-2. ^ a b c d Dave Morton (April 2015). "IBM Mainframe Operating Systems: Timeline and Brief Explanation For the IBM System/360 and Beyond" (PDF). ^ "IBM System/360 Disk and Tape Operating Systems Concepts and Facilities" (PDF). October 1970. GC2ij-5030-8. ^ "DOS and TOS Utility Programs" (PDF). August 1973. GC24-3465-8. ^ Computerworld,Sept.5,1977,p.40 - quotes an IBM task force report that referred to "price alone rather than by price/performance." ^ Edward L. Bosworth. "Programming Assembler Language on the IBM Mainframes: An Introduction". Chapter 3 – The Heritage of the IBM System/360. ^ Ed Thelen. "IBM System 360, Model 30". ^ Capers Jones. The Technical and Social History of Software Engineering. ISBN 0133365891. ^ IBM System/360 Disk Operating System 1401/1440/1460 Emulator Programs: Compatibility Support/30 & /40 (PDF) (Third ed.). IBM. February 1969. C27-6940-2. ^ Edwin D. Reilly (2003). Milestones in Computer Science and Information Technology. ISBN 1573565210. ^ Dan Ryan. History of Computer Graphics. DLR Associates Series. ISBN 1456751158. ^ Daniel N. Leeson; Donald L. Dimitry (1962). Basic Programming Concepts and The IBM 1620 Computer. Holt, Rinehart and Winston.